Marco Asensio said he never thought about leaving Real Madrid following his starring display for Spain in Tuesday's demolition of Croatia. It was the Asensio show in Elche, where the forward scored once and set up four more as Spain condemned World Cup finalists Croatia to the biggest defeat of their history – a 6-0 rout in the Nations League. Asensio was linked with a move away from Champions League holders Madrid amid reports of a potential switch to Liverpool. However, Asensio – who has five years remaining on his contract – told reporters: "I've never had the intention to go anywhere." The 22-year-old has flourished at Madrid, winning eight trophies, including the LaLiga title and two Champions Leagues, since linking up with the senior side in 2016 – having agreed to join from Mallorca in 2014. 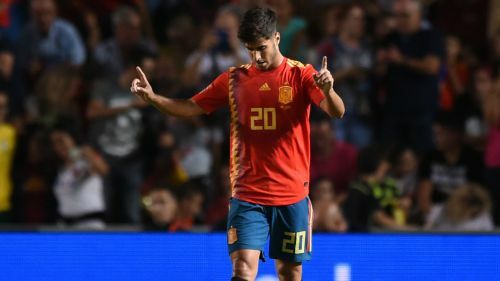 "This is my third season, in this one I think I have continuity and more prominence, and I'm seeing the performance I'm doing," Asensio said. Madrid will be looking to preserve their 100 per cent record after four matches when they visit Athletic Bilbao on Saturday.